First there was Web 1.0. Of course no one called it that back then, we were all too busy gushing over the fact that there was a Web to wonder about how it would evolve. The first generation web was AOL, CompuServe, Netscape, and dial-up Internet service. These were the heady days when the web was being built and commercialized. More recently, we've seen the development of the second generation, Web 2.0. Web 2.0 has been characterized by broadband Internet access, social networking sites, Wikipedia, AJAX interactivity and web-based software, and mobile devices. Web 2.0 sites even have their own look, the colorful, rounded typefaces and the catchy little names like Jangle, Clipperz, and Ploud. Web 2.0 has made the web more useful and content rich, interactive and social. Now, get ready for generation three. 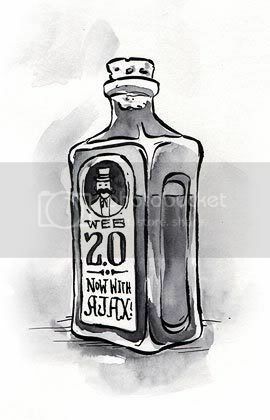 Web 3.0, as I predict it will come to be known, has no clearly defined boundary, but it will be the product of several different technologies coming to maturity at approximately the same time. These technologies will comprise what could be called "the intelligent web." Ubiquitous connectivity (meaning you'll be connected no matter where you are), network computing (distributed computing, grid computing, web services interoperability, cloud computing server farms), and the intelligent web (semantic web technologies, distributed databases, intelligent applications like natural language processing, machine learning, machine reasoning and autonomous agents), will all come together to make the web more powerful and useful (and fun) than ever. According to Nova Spivac (The Third Generation Web is Coming), "Web 3.0, expected to debut in 2007, will be more connected, open, and intelligent, with semantic Web technologies, distributed databases, natural language processing, machine learning, machine reasoning, and autonomous agents." For the first time in history, you will be witnessing the accelerating curve of technological progress, when you find that you haven't had time to become acclimated to one new technology before the next one crashes over you. Enjoy!